President Trump tweeted about a mobile app called VoteStand this morning, which led many people to ask, uh, what’s VoteStand? Apparently, the president believes the voter fraud app originally funded by conservative super PAC Winning Our Future, will help him prove his claims that 3 million people voted illegally in the November elections. That would be quite a feat, given that the current version of VoteStand has only somewhere between 1,000 and 5,000 installs according to Google Play’s publicly shared metrics, and sports only 6 reviews on Apple’s App Store. It would be generous to estimate that this app has 10,000 downloads in total, based on these metrics. According to app intelligence firm Apptopia’s analysis, the total number of downloads is 11,396 across both platforms. The firm notes the number may be slightly higher, because it only collects data when the app is ranked on the app stores’ charts. That is, it only collects data on days when the app has a ranking of at least #1,500 in some category on iTunes or is in the top 650 in a category on Google Play. A second report from another firm Sensor Tower confirms it’s seeing around the same numbers for total downloads, and App Annie confirms a total of 10,000, the majority which occurred in October. The current version, now published by tea-party affiliated organization True the Vote, was released this fall, ahead of the elections. It appeared in late September, 2016 on the iTunes App Store, and October 20, 2016 on Google Play, according to data from app intelligence firm App Annie. The largest number of downloads came a few days after the app launched, but there was also a spike on October 27, 2016, another on election day, and a third on November 10, 2016, Apptopia found. VoteStand was promoted by conservative news sites, including Breitbart, as a way to use your smartphone in order to report voter fraud in the form of text or photos. Or, as many would argue, it would be another means of intimidating other voters at the polls, by snapping photos of people or other issues of concern. 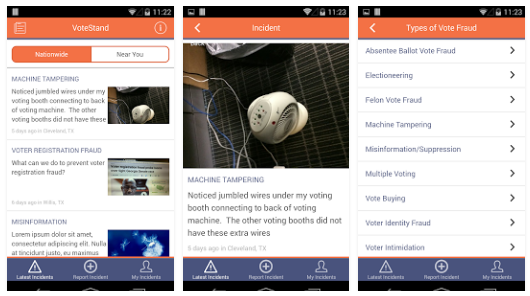 It’s unclear how many of those who downloaded VoteStand actually snapped photos or made reports via the app. The app isn’t currently showing any incidents in its “Nationwide” feed, so there’s not a way to view those reports. Trying to register for an account on the app is also currently failing. The President’s tweet this morning was in response to an appearance on CNN Friday morning by VoteStand’s founder Gregg Phillips. During the interview, Phillips was questioned about his claim of 3 million illegal votes. CNN’s Chris Cuomo asked Phillips to prove this claim, but Phillips said he would need a few more months to get that done. “And yet, even though you need a few more months to get this done, you think you know the answer right now,” Cuomo said. “Even though you can’t prove it, you think you know?” Cuomo pressed. It’s unclear what “proof” Phillips will come up with, or to what extent data from his app VoteStand, will be included in his report, should he release one in the future. But what is clear from the App Store data is that the mobile app VoteStand has nowhere near the download numbers or usage to contribute any significant data to these claims of voter fraud.